The expanding world of digital electronics has created the need for a program in advanced topics. Minimizing techniques, adders, counters, frequency dividers, DAC/ADC, memory, multiplexers, and applications are all included. 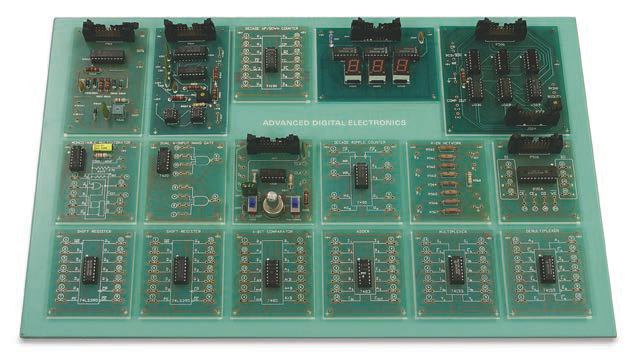 The Model 217SB Training System, Advanced Digital Electronics, is an add-on to the Digital Electronic Fundamentals system to provide a broader understanding of this topic. This program includes a combined text and laboratory manual, instructor’s guide, digital modules with storage board, and all of the required accessories. All plug-in modules shown on the storage board are constructed of rugged commercial grade PC boards that plug into the circuit panel. For added flexibility and convenience, ICs are socket mounted. The ECI transparent Circuit Panel used with all ECI training systems is in use in thousands of educational and industrial applications for basic circuit setup and advanced electronic design. 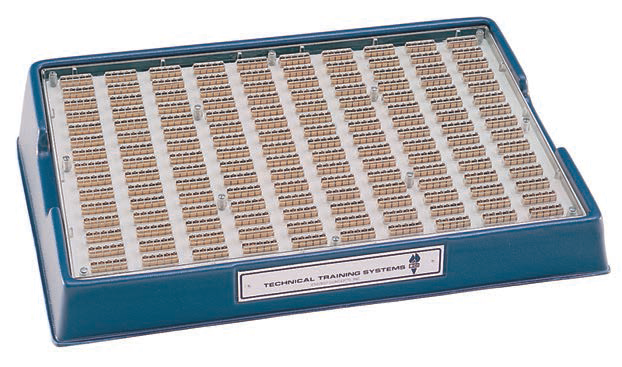 The circuit panel is completely flexible and suitable for any general breadboarding work. The patented design eliminates soldering, jiffy clips, snap fasteners, or random layout on opaque wiring boards.